The Bill is a major issue in these constituencies and the Congress, in the lead up to the polls, tried to scare the voters into believing that the Bill was a serious threat to their existence. GUWAHATI: Fourteen of Northeast’s 25 Parliamentary constituencies will go to polls in the first phase on Thursday against the backdrop of protests across the region against the Centre’s bid to get the Citizenship (Amendment) Bill, 2016 passed in Parliament. 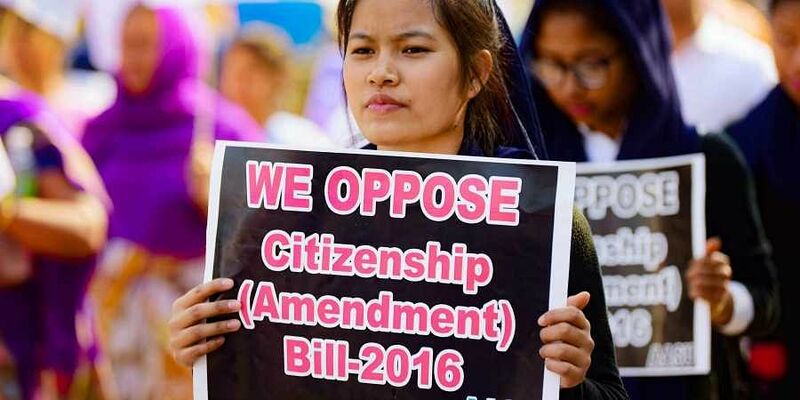 The controversial Bill, which seeks to grant Indian citizenship to immigrants belonging to six persecuted non-Muslim communities from Bangladesh, Pakistan and Afghanistan, had evoked widespread protests in Assam. Even now, as the BJP included the issue in its manifesto, various organisations have erupted in protests. They have made an appeal to the voters to reject the BJP for “playing with the lives” of Assamese and other indigenous communities. They fear the locals will be wiped off if the Bill is passed as “two crore” Hindus will migrate from Bangladesh. The BJP is trying to allay the fear of people. “The BJP will not take any step that hurts the interests of Assamese and other indigenous communities,” Chief Minister Sarbananda Sonowal said. Kaliabor, Jorhat, Dibrugarh, Lakhimpur and Tezpur constituencies are going to polls in the first phase. The contest in these seats will be between BJP and Congress. Kaliabor is held by Congress and the remaining four are by BJP. Former CM Tarun Gogoi’s son Gaurav of Congress is among the candidates. The Citizenship (Amendment) Bill is a major issue in these constituencies and the Congress, in the lead up to the polls, tried to scare the voters into believing that the Bill was a serious threat to their existence. In contrast, the BJP played development card. It highlighted how Narendra Modi government completed the works of a number of infrastructure projects which were hanging fire during UPA government. Apart from the five seats in Assam, two constituencies each of Meghalaya and Arunachal Pradesh and one constituency each of Nagaland, Manipur, Mizoram, Tripura and Sikkim are also going to polls. Assembly elections will be held simultaneously in Arunachal and Sikkim. READ: Will BJP face ‘Citizenship Bill’ ire in Northeast? In Arunachal, nine candidates are in the fray – four in West Arunachal seat and five in East Arunachal seat. A triangular contest is expected in West Arunachal seat among sitting BJP MP and Union Minister Kiren Rijiju, former CM Nabam Tuki of Congress and Jarjum Ete of JD-S. Khyoda Apik of Meghalaya CM Conrad Sangma’s National People’s Party (NPP) is also in the fray. Ete, a social worker, is immensely popular especially among women for her campaigns against child marriage and polygamy. She is Arunachal’s first ever woman candidate in Lok Sabha polls. In the Arunachal East seat, it will be a fight between former Minister and Congress nominee James Lowangcha Wanglet and BJP’s state unit chief Tapir Gao. A triangular contest is expected among BJP, Congress and NPP in Assembly polls. There are 184 candidates, including 11 women. a whopping 131 of them are crorepatis. Citizenship (Amendment) Bill, bad roads are among major issues. There are four candidates in the fray in Nagaland but the contest is expected between sitting MP Tokheho Yepthomi of ruling Nationalist Democratic Progressive Party and former CM KL Chishi of Congress. The two parties are locked in a straight contest also in by-elections to Aonglenden Assembly seat. The unresolved Naga political problem, bad roads are among major issues. In Manipur, eight candidates are contesting from Outer Manipur seat which is reserved for tribals. The constituency will see a triangular contest among BJP’s HS Benjamin Mate, Congress’s K James and Naga Peoples Front’s Lorho S Pfoze. The BJP candidate has already hogged the limelight as he is being allegedly backed by Kuki (tribe) militants. The issues here are Naga political problem, statehood for Kukis etc. In Meghalaya, there are nine candidates. The Tura seat will see a straight contest between former CM Mukul Sangma of Congress and former Union Minister Agatha Sangma of NPP. Agatha is the daughter of former Lok Sabha speaker PA Sangma and sister of state’s CM. State BJP vice-president Rikman G Momin is also contesting from here. Similarly, a triangular contest is expected among former Union Minister and sitting MP Vincent H Pala of Congress, Sanbor Shullai of BJP and Jemino Mawthoh of United Democratic Party in the Shillong seat. Agatha and Mawthoh are the consensus candidates of state’s ruling alliance. Illegal rat-hole coal mining, Citizenship (Amendment) Bill are among major issues. In Mizoram’s lone LS seat, six candidates are vying. Ruling Mizo National Front candidate C Lalrosanga, who is a former director of Doordarshan, stands a good chance of winning. The other candidates are Nirupam Chakma of BJP, sports organizer Lalnghinglova Hmar, an independent who is backed by Congress and Zoram People’s Movement, Lalhriatrenga Chhangte, also an independent who is a former deputy controller of mines, former Indian Navy sailor TBC Lalvenchhunga of PRISM and Lalthlamuani who is contesting as an independent. In Tripura West seat, there are 13 candidates but the contest is expected among Pratima Bhowmick of BJP, Subal Bhowmick of Congress and sitting MP Shankar Prasad Dutta of CPI-M. Unemployment is a major issue here.